The “wall” has come full circle. What began as a mnemonic device to help an attention-challenged presidential candidate stay on message is now being promoted by a mnemonic device created by that President to build support for, well, actually building his wall. 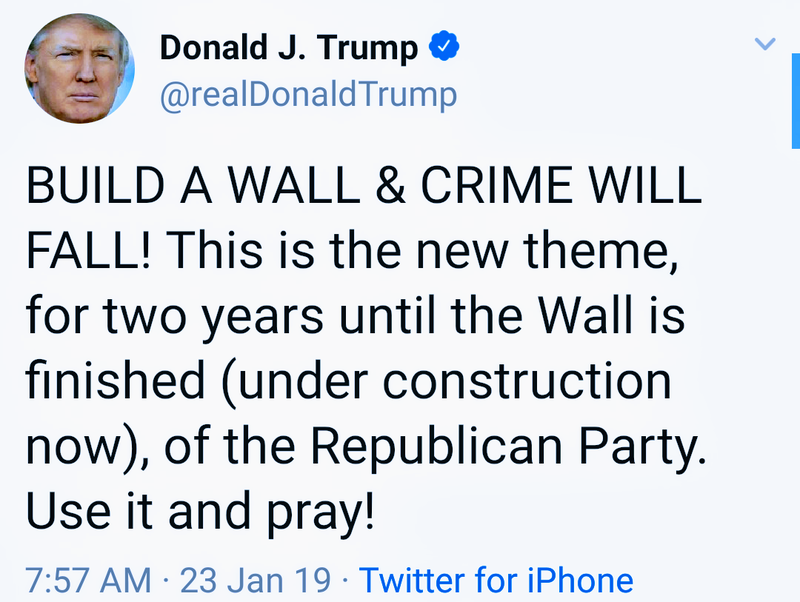 “BUILD A WALL & CRIME WILL FALL,” he tweeted not once, but twice this morning, just in case you weren’t paying attention. As far as promotional copy goes, the slogan is simple and possibly memorable. How persuasive it is likely depends on what your bias was leading into the push. But in terms of its veracity, well, let’s just say it would fail any truth-in-advertising test. Give the President props for staying on message. He’s got the frequency thing down for sure. The problem is his constant harangue that the U.S. is experiencing a surge in crime, due mainly to the influx of illegal immigration from its southern border, simply isn’t true — whether you believe a wall would actually curtail it or not. According to an analysis by the Pew Research Center, the President’s claims about crime are just a manufactured crisis intended to feed fear and bolster his base. You can read it in depth here, but there are five essential bullets. The key point is that violent crime has fallen sharply in the U.S. over the past quarter century, and property crime has declined significantly over the long term. Perhaps most importantly, public perceptions about crime in the U.S. do not align with this data.